Jeffrey Drazen and the Hagfish | WhaleTimes, Inc.
We’re excited to have Dr. Jeffrey Drazen, a biologist who studies deep-sea fishes join us to share his thoughts on two of our Hagfish Day stars, the hagfish and the barreleye. He was kind enough to answer them to help us understand and appreciate this little incredible fish. What was your first thought when you heard that hagfish finally got their own holiday? 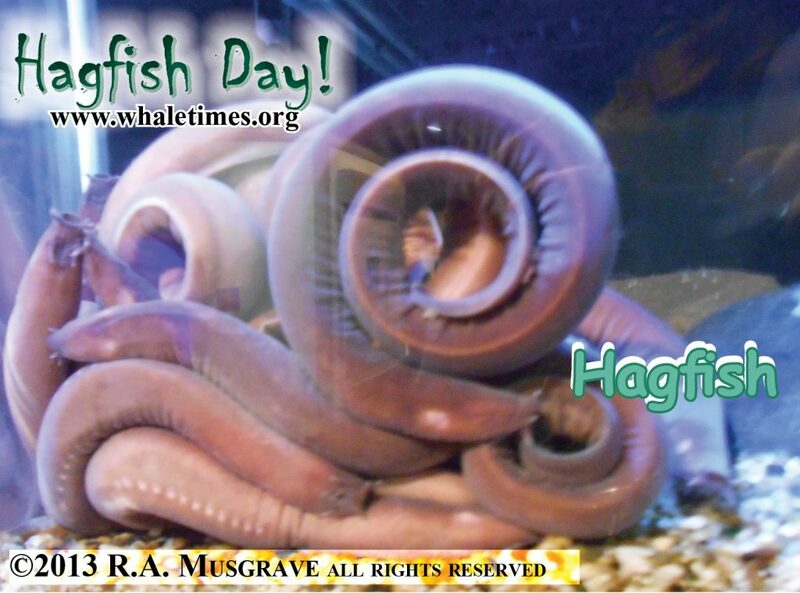 JD: I was very surprised and wondered who would love hagfish enough to give them their own day of recognition! They are very cool but so few people know enough about them to appreciate them. Do you think other animals might be intimidated by the beauty that is hagfish? JD: Many animals are intimidated by hagfish! Their slime alone is enough to deter all but the most voracious predators! What do you want kids to know about hagfish? JD: Hagfish may be ugly but they represent the ancestors of all of today’s fishes and other vertebrates! How does something like the oil spill catastrophe in the Gulf affect hagfish (and other deep-sea animals)? JD: We still aren’t sure how the Gulf oil spill will affect the deep sea, but scientists are currently trying to find out. Several spots on the deep-sea floor near the Horizon rig were long term study sites for scientists. These places held cold-seep communities where natural gas was slowly seeping out of the mud and fueling bacterial growth which then provided food for many strange creatures like tube worms, clams, white squat lobsters, and many others. These communities may now be smothered in heavy tar or poisoned by oil dispersants. Only time will tell but we will get a good idea because of all the studies that went on before the spill happened. How long have you been studying hagfish/deep sea fish? Do you study them from shore, a ship, a sub? What are you studying now (what is your research about)? JD: I’ve been studying deep-sea fish for 16 years. I study them in the laboratory, from ships, and from submarines. Right now, I am studying deep-sea fish diets and their metabolism. (Metabolism is how fast an organism uses energy.) In order to understand how deep-sea fish are connected to other parts of the ocean like the surface waters for example, we need to know what they eat. Knowing how much they eat is related to their metabolism or pace of life. The deep-sea is the biggest habitat on earth. So its animals are very important to how the whole world works and stays in balance. For instance, many of its animals provide food for things we eat like tuna and swordfish (they like to eat deep-sea squid and lanternfishes). Fishermen are fishing deeper and deeper taking species like grenadiers and Chilean seabass, deep-sea species we know very little about. Deep-sea animals are also very likely to be hurt by climate change but we still don’t know how such changes would affect the ocean ecosystem as a whole.